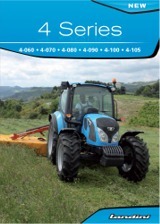 The 4 Series is the very latest addition to the Landini tractor family. The range currently comprises three models from 90 to 107 hp powered by 3.6L Tier 4 Interim engines. These will be joined by three other models from 61 to 75 hp equipped with advanced 2.9L engines meeting the Tier 4 Final emission regulations. Main features include a new four-post cab loaded with amenities and a brand new Argo Tractors-designed 12+12 speed transmission with creeper, power shuttle, Hi-Lo powershift options and electrohydraulically-engaged two-speed PTO, offering a top speed of 40 km/h in economy mode. Available in both platform and cab versions, the 4 Series tractors are ideal for seed bed preparation activities, such as ploughing, tillage and harrowing, which require stability and strength, as well as for work between tight orchard rows, where agility is paramount. Built to provide outstanding visibility and easy manoeuvrability, these tractors are equally perfect for forage harvesting activities and front loader operations, and ensure comfort and safety during high-speed road transport. More Information..